Fully remastered and refurbished in 2014, the Howard Building is an incredible, versatile and sophisticated building ideal for conferences, weddings, drinks receptions and registration areas. During the refurbishment Downing College were keen to ensure they put major emphasis on energy efficiency and soundproofing. 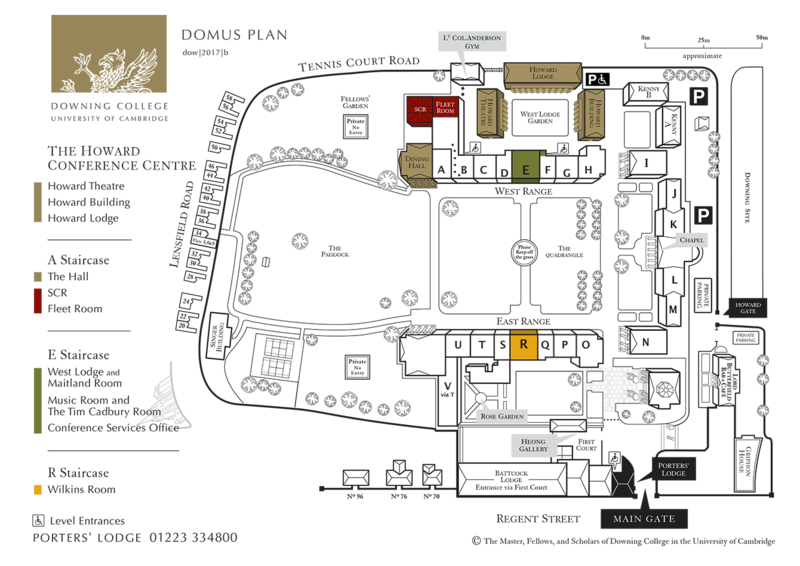 The building is given exclusively to our clients when booking the rooms to ensure each event has its privacy and space. The Howard Drawing Room offers a large reception area, ideal for refreshment breaks, registration areas and drinks receptions as it has a fully licensed bar built in. The Howard Assembly Room is perfect for conferences with a wide range of set ups available to fit your requirements. Additionally it provides a beautiful and elegant setting for Civil Ceremony weddings. With lift access between the floors, the Howard Building is fully accessible and is located in Howard Court opening out on to the West Range Garden which is ideal for summer barbecues and refreshments.